UTQIAGVIK, ALASKA - October 6, 2017: Josiah Patkotak fills out a report for the wildlife department after successfully striking a whale with his family's crew, Patkotak Crew, while Senior Wildlife Biologist, Robert Suydam, looks on. Photo Courtesy Ash Adams. UTQIAĠVIK, ALASKA—Arnold Brower Jr., a 70-year-old Iñupiat whaling captain, can recall his first encounter with scientists clearly. It was 1977, and the International Whaling Commission (IWC) had just placed a moratorium on bowhead whale hunting, after a US government-led population survey determined the marine mammals’ numbers to be dangerously low. But Brower, who has been hunting in the icy Arctic waters surrounding Utqiaġvik (formerly Barrow) since he was a boy, felt certain that conclusion was wrong. And so Brower and his fellow whaling captains decided to take matters in their own hands. They formed the Alaska Eskimo Whaling Commission (AEWC), and partnered with wildlife biologists at the local government of the North Slope Borough to try to improve the population census. Within a few years, the hunters amassed clear evidence that researchers with the National Oceanic Atmospheric Administration had been undercounting bowheads, by overlooking whales that swam hidden beneath sea ice and far offshore. Armed with a revised census, the hunters convinced the IWC to grant them an annual subsistence harvest quota. Over the years, the quota has increased to meet the community’s subsistence needs, and the bowhead whale population has grown in step. Western science has a long history of dismissing of indigenous knowledge. But in Utqiaġvik, the 4,400-strong Iñupiat community at the northern tip of Alaska’s North Slope, scientists have come to rely on Native experts’ unmatched familiarity with the Arctic environment. 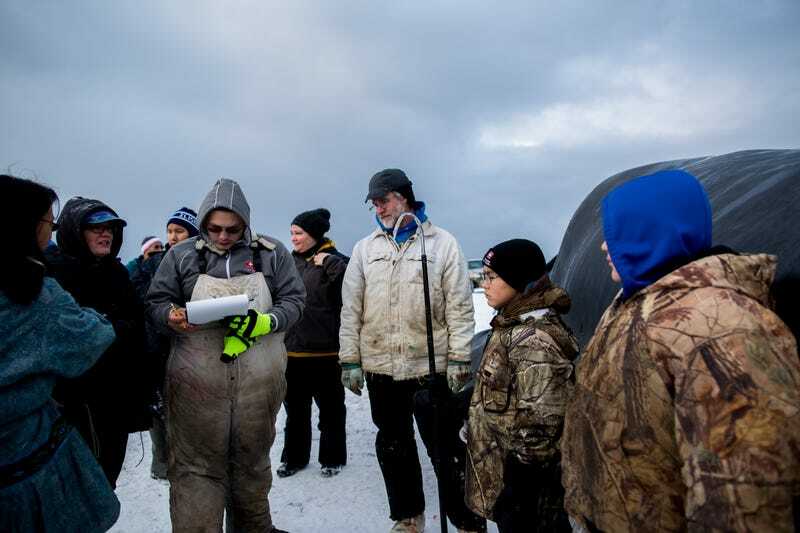 Now, some of the same whalers who worked with biologists to revise the bowhead census forty years ago, along with other Native hunters across Alaska, are partnering with researchers to document and interpret the signs of human-caused climate change. Few issues crystallize the difference between academic knowledge and indigenous expertise like climate change, an inescapable reality for the Native Alaskans whose livelihoods depend on the seasonal cycles of ice and animals. Plunging caribou populations linked to rising temperatures and development are threatening the food security of subsistence hunters in Alaska’s interior. Thawing permafrost on Alaska’s North Slope is causing roads and buildings sink and shift, cracking water pipes and sewage lines. Tundra fires are becoming more frequent and severe, posing an unprecedented threat to villages located hundreds of miles from emergency responders. An Inuit woman celebrating the spring whale catch by blanket tossing Point Barrow, Alaska. The woman jumps from an elastic walrus skin held by her fellow celebrators. 1921. Via National Museum of Denmark. But for Utiaqgvik, and other villages on Alaska’s North Slope, no change is more profound than the recent, dramatic retreat of Arctic sea ice, which Natives use to fish, hunt, and travel between villages. A generation ago, the first “shorefast” ice would form in October, creating miles-wide platforms from land to sea that were stable from early November until mid-July. Now, the shorefast ice firms up later in the fall, and it breaks up weeks earlier in the spring. Even in the dead of winter, the ice is less predictable than it used to be, making it more dangerous to traverse and more difficult to use as a platform for harvesting whales, seals, and walruses. Eicken got his first taste of the extensive environmental knowledge possessed by hunters back in 2000, when Native experts and scientists gathered at a symposium in Utqiaġvik to share their observations of changing sea ice conditions. It was the first in a series of community dialogs that would lead to several formal collaborations, including the Sea Ice Zone Observing Network (SIZONet), and more recently, the Alaskan Arctic Observatory and Knowledge Hub (AAOHK). Through these networks, Alaskan Iñupiat and Yup’ik hunters work with researchers at the University of Alaska Fairbanks to record, archive, and disseminate observations of sea ice conditions in searchable online databases, using terms in their Native languages and English. (There are more than 100 terms for sea ice in Kingikmiut, the dialect spoken by the Iñupiat people of Wales, alone.) For researchers who rely mainly on satellite remote sensing data, hunters’ vivid descriptions of conditions on the ground offer invaluable insight into changing weather conditions and ice dynamics. Lee has been heavily involved with one of the community-oriented products of these collaborations, the Sea Ice for Walrus Outlook (SIWO). A partnership between the National Weather Service, the Eskimo Walrus Commission, and others, SIWO combines local observations with data collected by satellites to issue a weekly springtime weather and ice forecast for villages in northwestern Alaska. These forecasts help hunters decide when when it’s safe to venture onto the ice to catch walruses, a task that is becoming more challenging as nearshore ice breaks up earlier. “It’s a good practice, the co-production of knowledge that includes indigenous knowledge,” she said. Lee said her long-term hope is to build a network of hunter/observers who can help biologists keep track of changing marine mammal migration patterns, particularly the migration of gray and bowhead whales, which seem to be traveling north from the Bering to the Chukchi and Beaufort seas earlier in the spring. “It’s a great way to work,” said Craig George, a wildlife biologist at the North Slope Borough, noting that he and his colleagues have long benefitted from a close relationship with hunters, who allow them access to recently-harvested bowheads for all kinds of anatomical studies. As far as climate change goes, he and the North Slope Borough research team are most concerned about its impact on the body condition of the animals, invasive disease outbreaks, reproduction, and migration patterns. Last year, the team received its very first report of kidney worms in a bowhead from the women among the whaling crews. They speculate that it could be the result of greater interactions with species known to carry these parasites, like humpback whales, but only long-term monitoring and research will tell. Scientists working with indigenous knowledge, meanwhile, struggle with skepticism from the academic community. Many experts perceive local observations to be anecdotal—inferior to data collected in a quantitative study. “It’s an incredible struggle to learn how to use that rich information [from local indigenous experts] when you’re classically trained,” Lee said. Underlying even the most successful collaborations are the scars of colonialism—of forced settlement and forced education, which diluted the traditional identities of many Native Alaskan communities. Some elders, like ICAS president George Edwardson, remember a time when Native Alaskans were deliberately mistreated in the name of science. A charismatic geologist with long silver hair, Edwardson recalls being administered radioactive iodine tablets a child in the 1950s, as part of a US Air Force experiment that purportedly sought to determine whether the thyroid played a role in Eskimo cold tolerance. Decades later, a National Research Council-led investigation concluded that many Native subjects were not aware they were being asked to consume radioactive material for an experiment that offered no health benefits. “We were lied to,” Edwardson told me. As for adapting to the challenges climate change will bring, that’s something he’s confident his people will do, with or without the aid of scientists. Hopson expressed a similar sentiment. “We’ve been making changes and adapting ever since we got here,” Hopson said, noting that hunters are taking advantage of more open water by using bigger boats, and they’re growing accustomed to the whales’ shifting migratory patterns. Jensen observed that the people of the North Slope have responded to climate changes in the past—not to mention they’ve managed to survive for millennia in an incredibly challenging environment. “It’s something to be absolutely proud of,” she said. In her mind, one of the tragedies of human-caused climate change is that it’s causing that long history of adaptation to be lost, as centuries to millennia-old archaeological sites thaw out and erode away faster than they can be excavated and studied. “There is data that will not be there in 10, 20, 30 years,” she said.